One of the first and most important decisions you'll make when you design any marketing piece is to choose the right audience. Only after you know this will you be able to tailor your message to best appeal to that group of people. In this exercise, you'll create a couple of fictional contacts with email addresses that you can receive mail from, and then set up a test segment that includes those contacts. This test segment will be useful later when you begin to experiment with customer journeys. Go to Marketing > Customers > Contacts. This takes you to a list of existing contacts. On the command bar, select New. The New Contact page opens. First Name: Enter a fictional first name. Last Name: Enter a fictional last name. Email: Enter your own email address (or one that you can receive mail from). Address 1: City: Enter a fictional city (for this example, we use Atlantis). This will make it easy to create a segment that only includes fictional contacts. On the command bar, select Save & Close. Create a second contact similar to the one you just made. Use the same email address and fictional city, but use a different first and last name. Go to Marketing > Customers > Segments. This takes you to a list of existing segments. On the command bar, select New. The New Segment page opens, with the General tab shown. Enter information on the General tab to name and describe your new segment. Be sure to leave the Segment type set to Dynamic segment. Open the Definition tab. This is where you establish the rules of membership for your segment by building a database query. 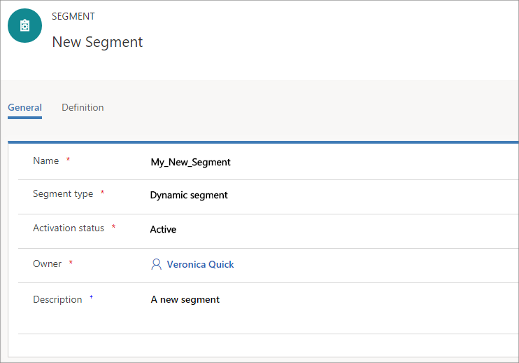 The Definition tab offers three ways to build and view your query: Flow, Designer, and Query. You can use whichever view you prefer—the result will be the same. For this procedure, you'll use the Designer view, which is both easy to use and compact. Flow is optimized for combining segments by using logical operators. Designer is optimized for defining sets of logical rules and conditions that filter out contacts. Change the drop-down list currently set to All* to addres1_city. This changes the query from one that finds all contacts to one that looks for contacts from a specific city or cities. It also adds two more inputs, which you'll use to finish defining this clause. Leave the next drop-down list set to is. This is the operator (other operators include is not, greater than, less than, and more, depending on which type of value you are working with). Enter the fictional city name that you chose for your test contacts in the field to the right of the operator list (Atlantis), and then select the Enter key on your keyboard. When you select the Enter key, your value becomes a button with an X on it. If you like, you can add more city names by entering them here, or remove existing ones by selecting the X. If you add several cities, they will be combined with an OR operator, which means you'll find contacts from each of the listed cities. Here's an example of how a simple query that finds all contacts from Atlantis might look on the Designer tab. You can build very complex queries by using the tools here, combining AND clauses and OR clauses, and adding groups of additional clauses that you can combine with the main clause and other groups by using Union, Exclude, or Intersect operations. You can also move freely between the Flow, Designer, and Query tabs to see how your query looks when presented in these various ways. On the command bar, select Save to save the work you've done on the segment so far. On the command bar, select Go Live to publish the segment (you won't be able to use it in a customer journey until it goes live, even though you've saved it). 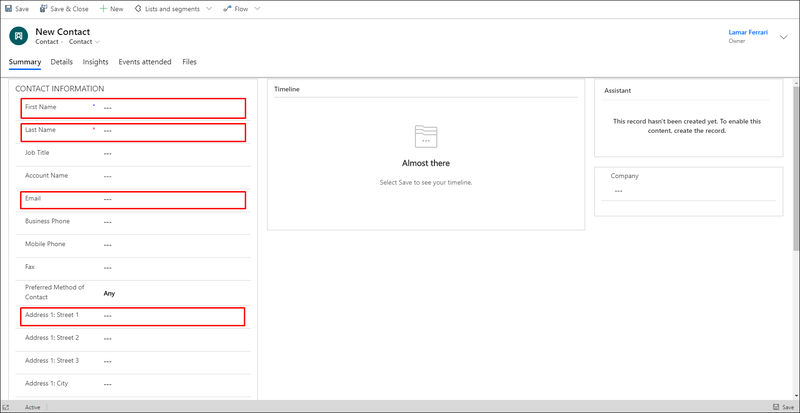 Dynamics 365 for Marketing checks the segment for errors and reports any problems it finds. If an error is reported, fix it and try again. 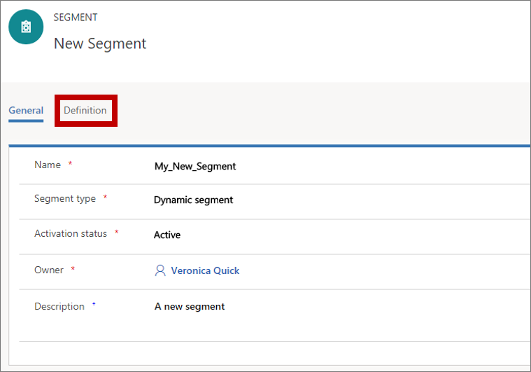 If no error is found, your segment is copied to the Dynamics 365 for Marketing email marketing service, which makes it available for use by a customer journey.